What Are The Best Acupressure Slippers/Sandals? 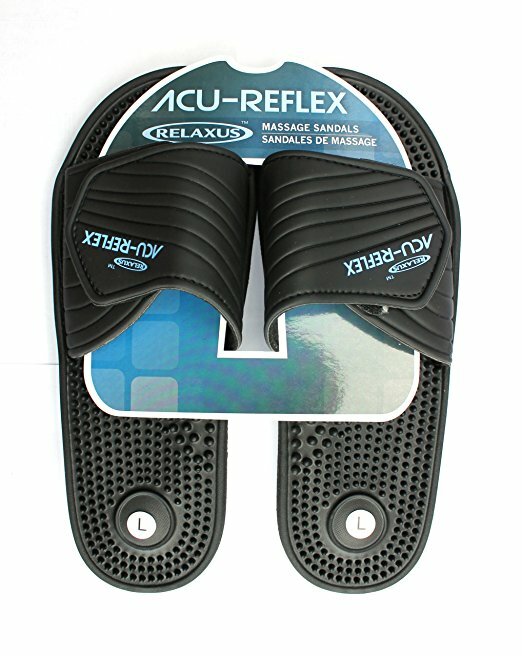 For our choice of best acupressure slippers, we recommend the Kenkoh Massage Sandals. We can't find anything that's higher quality than these on the market. They also have a very wide selection to choose from, whereas most competitors only have a limited choice of shoe styles and sizes. What Are Acupressure Slippers & How Do They Work? Acupressure slippers are a pair of shoes that are shaped like ordinary sandals / slippers / flip flops / whatever else you want to call them. However, these sandals are special in that they have hard plastic or wooden tips on the inside of the foot sole area that are designed to poke and prod at the acupressure points in your feet. Why would you want to poke your own feet as you walk around, you may ask? Because by wearing a set of acupressure slippers, you can stimulate dozens of different acupressure points located on the bottom of both feet at once. Let's take a look at one example of how acupressure slippers look, just to get an idea. As you can see from the close-up image above, the insides of the acupressure slippers are full of solid bumpy objects that poke and prod at the acupressure points on the bottoms of your feet as you walk. Slippers vs Sandals vs Shoes? Don't be confused by the difference in naming between some products. 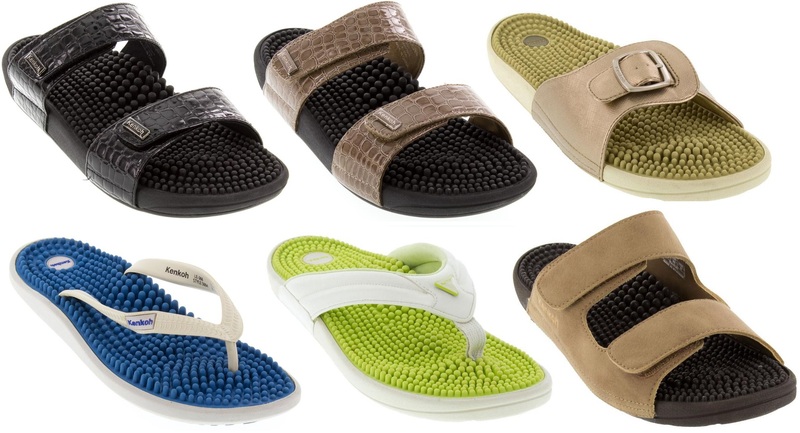 Some products in this category call themselves slippers, or sandals, or shoes, or maybe even something else, but all of them are generally designed the same way with an open-toed design that easily slips on and off of your feet. Whether it's called a slipper or a sandal or a shoe, they all stimulate the acupressure points of your feet with lots of little pokey things! Acupressure vs Reflexology vs Shiatsu - What's The Difference? Some shoes in this category market themselves as acupressure slippers whilst others market themselves as reflexology slippers, or shiatsu massage slippers, or some other kind of foot massage slippers. Reflexology is a type of massage that focuses on stimulating certain points on the feet and elsewhere on the body, but it focuses on "zones" around your foot instead of on stimulating the exact points found on the acupuncture meridians like acupressure does. You can read about acupressure vs reflexology in our acupressure guide, but the short explanation is that you don't need to worry when it comes to buying a pair of shoes for it. The same pair of acupressure shoes will stimulate many acupressure points, as well as many reflexology zones, as well as many shiatsu massage points (shiatsu is a Japanese form of massage that is usually identical to regular Chinese acupressure, but varies by practitioner). In short, the same pair of shoes will fulfill all of these purposes and more. Let's take a closer look at some of the best selling acupressure shoe options on the market, and see what customers had to say about them. The Kenkoh massage sandal line is a luxury acupressure sandal option. The prices are high because the quality is high. The various shoe designs feature hundreds of rubber acupoint stimulators that will comfortably massage all the acupoints on your feet as you walk around in style. See their website to view even more designs than the ones pictured here. Large selection of stylish shoe designs. High quality material that is made to last for years. Good selection of shoe sizes to fit any foot. Some designs come with adjustable velcro or belt straps to adjust tightness. This is the only super name brand shoe that we recommend on our list of acupressure slippers. Made by Adidas, the shoe features tons of little rubber nubs on the inside of the foot area to stimulate the acupoints on the bottom of your feet as you walk. Customers refer to this as a nice foot massage while you walk. Big range of sizes for both men and women. Rubber nubs are more comfortable than hard plastic acupoint stimulators in other shoe designs. These acupressure massage sandals contain hundreds of hard rubber bumps that massage that acupoints on your feet as you walk. They feature a velcro top that allows you to partially adjust the tightness of the foot strap so as to make the shoe fit better. 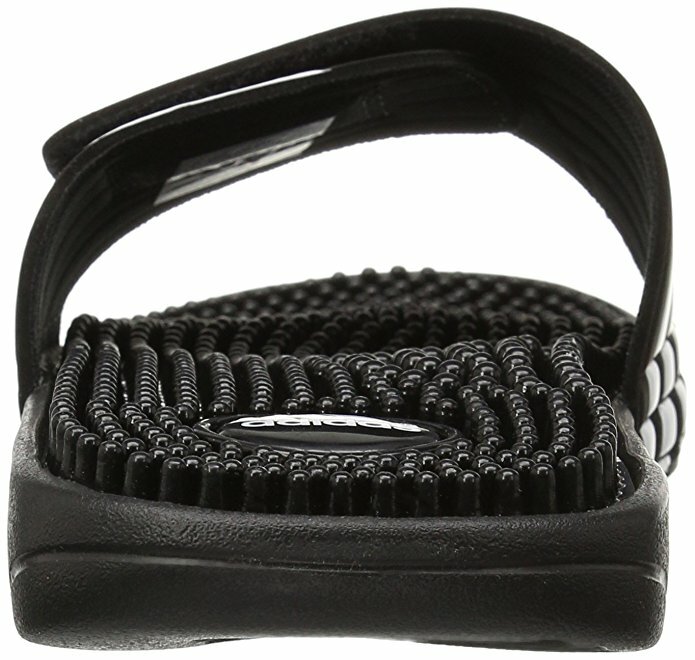 Velcro strap for adjusting shoe tightness as you see fit. These slippers are very impressive because of the unique design of the acupoint stimulators on the insoles of the shoes. Each stimulator is a hard plastic knob that actually moves up and down and rotates the tip of the knob as you shift the weight of your foot. This creates a unique massage sensation that's unlike the sensation created by normal static pointers on other shoe designs. Unique design provides rotating stimulation of the acupoints. Velcro strap for adjusting tightness of the grip on your foot. 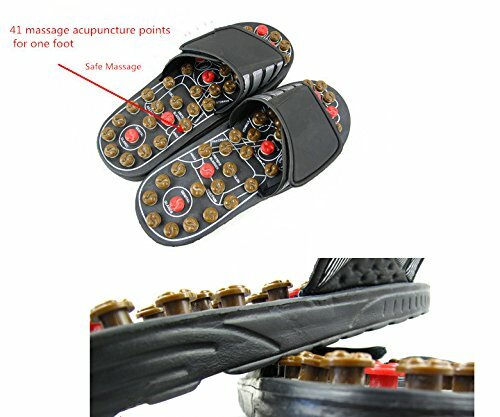 The unique design of these acupressure slippers is really what sets them apart from other shoe options. 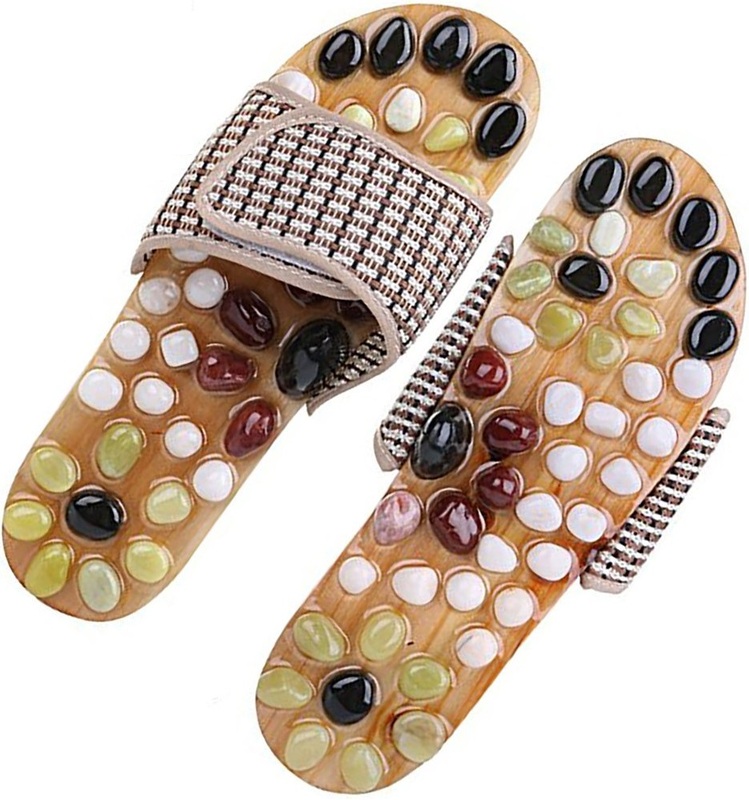 These slippers use real stones that are attached to the soles of the shoe, which presses hard into the acupoints of your feet to significantly stimulate them. These beautiful shoes are also great for making a style statement - if you can wear them in public for long enough without hurting your feet due to the intense pressure on your feet. Uses real stones to stimulate your acupoints. Velcro strap allows adjusting of shoe tightness. Very intense pressure sensation for maximum treatment.